Dollar to a doughnut the valve guides were reamed for "clearance" and are now too large for the valves. It is never necessary to ream an MB guide to fit -- they are correct from the factory (unless defective). The other posibility is incorrectly installed valve guide seals -- I'm not sure if they are the same size for intake and exhaust or not, but if switched, might leak. They could also not be snapped down completely or damaged during installation, also. Quite a bit of oil will go down the guides if the seals are bad -- even on a diesel, especially at idle, when there is some vacuum in the intake. Unfortunately this means disassembly or ignoring the problem! Have you found out any more about the oil leak? what happened to that 201?! What happened to that maroon 190D?? That thing got TRASHED! Was that yours? I was looking at the other photos you have on your site. First, I tried emailing a response to your private question, but your email account had "exceeded quota" and the messages bounced. I'll try to re-send the info tonight. Second, about the oil leak. No, I don't really have any new info. I have thunk about it though. :p I'm 99.99% sure the head itself is fine, and the gasket is OK too. I'm almost positive that the problem is the valve seals or guides. The intake & exhaust valve stems are about 1mm different, with different seals. I plan to pull the cam and see if they are backwards or not (they are color coded). If they are OK, the only other thing could be the guides. However, aren't the seals supposed to keep oil out of the guides in the first place? Hmmmm. I'm hoping it's just the seals! If it's the guides, as psfred mentioned, I'm gonna have to get medieval on the machine shop that screwed them up (and they do a LOT of Mercedes heads, including diesel heads!). I put nearly 4000 miles on the car in the last month and the symptoms have not changed. Car runs great, oil leaks from the exhaust manifold. Now it looks like I might have a slight seepage from other exhaust ports too, not as bad as #6. Which again points to valve guides/seals. The #6 port could be worse because the exhaust gas must flow from front to rear, the the entry to the turbo is via the #6 port, so oil could blow back and collect there from the other ports. Yeah, I rolled that in Idaho on I-84 between Twin Falls and Pocatello (IIRC). That was back in 1995, I only had the car about 10 months. I was NOT happy because the car was incredibly immaculate - I mean near flawless cosmetically, with a cream-beige interior. It was a 5-speed, used almost no oil, and got 40mpg on the freeway. The short version on the wreck is: I was doing 75 on a sunny day, on clean, dry pavement. There was a black cloud off in the distance. I crested a hill, and the road was white with ball-bearing-style hail. I let off the throttle and the car slowly pivoted, slid into the median, where the tires dug into the dirt and flipped it over. When the cops finally arrived 20 minutes later, he almost spun out trying to stop, which is probably why I didn't get a ticket - it was a real fluke of a storm. The car was totaled but it still started & ran, all 4 doors opened & closed, and the sunroof still worked! That convinced me to buy another Mercedes instead of a newer Jetta or something. If I had flipped my VW Dasher the roof probably would have collapsed on my head, the Benz stayed intact. And that was the "little" Baby Benz W201! Eventually I plan to make some web pages to go along with the photos out there, to explain things. Maybe later this year if I have time...? Well, it's over a year later, but I finally fixed the problem today. The cause was... (drumroll please) ... the valve seals. I had to buy the SirTools valve spring tool so I could do the work myself (why oh WHY can't they give a simple instruction sheet with tools that are designed to work on multiple engines!? Idiots!) which cost ~$200 from IMPCO, the cheapest I could locate. What I found was the number 4 exhaust seal was not seated! The other 11 seals required work to yank off with pliers. Another point was when the new head was assembled at the machine shop, I gave them aftermarket seals (not knowing the OE were different). Seems that those were the old type, and MB has since rolled them to a newer Viton material with metal base (see photos below). So while I was in there I replaced all the seals with the new genuine Mercedes seal kit, which costs 3 times as much as aftermarket. AND, the OE kit came with plastic installation tubes! This prevents the seal lip from getting damaged by the keeper groove at the top of the valve stem. I bet the machine shop didn't use anything when they installed my aftermarket ones. Last edited by gsxr; 03-28-2003 at 08:26 PM. Thanks for all the great photos! You are a big help to all of us OM603 owners. By the way, you show the mark of a truly confident wrench. Those of us who are basically hacks, and I number myself amoungst them, wouldn't dream of not stuffing a rag in the turbo output to avoid the eventual dropping of a hard object into the turbo. My greasy hands have an annoying habit of dropping the wrong (read irreplacable) part into the wrong place at the worst time. I have learned the hard way to always plug everything with rags to save me from myself. It makes me nervous just looking at your last photo. Thanks again for sharing and all the great photos. ROTFL!! Actually I never even thought of that. I believe if something were dropped down there, I could fish it out the inlet side. (??) Good point though for future reference. However I was scared to death of dropping something into the timing chain cavity, you know, like a valve keeper or something. Now THAT would be bad... have to pull the oil pan at a minimum, or timing case at worst... so I had a rag covering that most of the time. This job actually started as a timing chain replacement, but ended as a valve seal job with the old chain still installed! That job scares me, I really don't want to drop a chain link or side plate down there. Probably stuff it with rags tightly on both sides while I'm working on the chain links! In my opinion, doing a chain replacement is a two person job; one to manage the two ends of the chain, on to turn the engine. Unless you use the tool that goes over the top of the sprocket. When doing my first chain replacement, on a 617, I wasn't prepared for the slippery weight of the chain and dropped it into the chain case. After a few minutes of major panic, I was able to hook the end with a bent coat hanger and pull it out. I then secured both ends with bungee cords to keep tension on the chain and got a helper to turn the engine. Fortunately no slipped gear teeth or lost timing. Think I was very lucky. ewstan, you are 100% correct. I did indeed buy the chain loader tool for the OM60x engine. This is the item that goes over the sprocket and keeps the chain locked onto the teeth so it can't jump out of place or fall down into the cavity. It's the OE Mercedes tool, and only cost about $20. The timing chain project will be coming up soon now that I got the valve seals done! im trying to figure out what that tool does... compressing the valve springs for removal? is one able to replace valves guides on these engines without removing the cylinder head? if so, how do you hold the valves up? Last edited by jeremyreuben; 01-25-2019 at 04:11 AM. Yes. This allows replacing the valve stem seals only. Rotate the engine so the piston is at TDC on the cylinder you are working on, so the valves rest against the top of the piston. 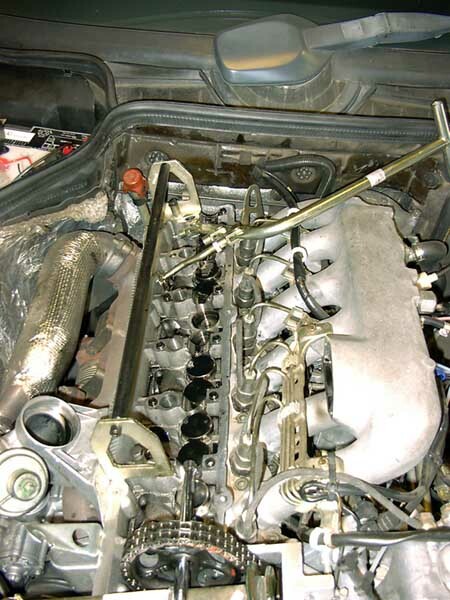 You cannot replace valves or guides without removing the cylinder head. Guides are a pretty rare failure on the 60x heads.